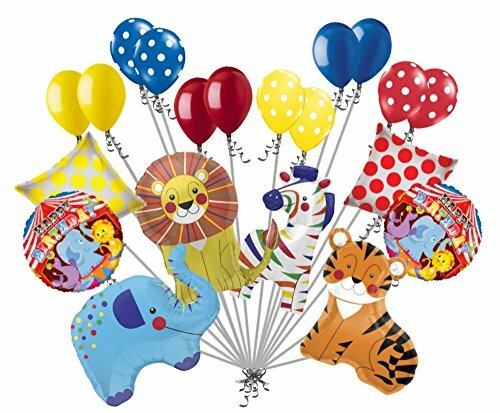 Included in this bouquet: 20 Balloons Total 1 - 35" Colorful Zebra Shape Balloon 1 - 36" Colorful Elephant Shape Balloon 1 - 33" Colorful Tiger Shape Balloon 1 - 28" Colorful Lion Shape Balloon 2 - 18" "Happy Birthday" Circus Round Balloons 1 - 18" Yellow Dots on Clear Square Balloon 1 - 18" Red Dots on Clear Square Balloon 12 - 12" Mixed Latex Balloons (2 Yellow, 2 White Polka Dots on Blue, 2 Red, 2 White Polka Dots on Yellow, 2 Blue, 2 White Polka Dots on Red) These items may arrive flat or in retail packaging All balloons sold online are shipped out with no air/helium. Filled balloons don't travel well through different elevations. All balloons are sold without ribbons. If you have any questions about this product by Jeckaroonie Balloons, contact us by completing and submitting the form below. If you are looking for a specif part number, please include it with your message.